UTech, Ja. Launches 4th Annual Business Model Competition — UTech, Ja. On Thursday, October 27, 2016 the University of Technology, Jamaica (UTech, Ja.) led by the Joan Duncan School of Entrepreneurship, Ethics and Leadership (JDSEEL), College of Business and Management (COBAM) launched the 4th annual UTech, Jamaica Business Model Competition (UTech, Ja. BMC) 2016/2017 at its Papine campus as part of the thrust to promote a strong entrepreneurship culture among the student body as well as to provide the required support to develop business ventures. Mr. Michael Steele, Head, JDSEEL in his overview noted that the experience of hosting the of the business model competition over the last three years has been a mixture of “successes and challenges.” He shared that the initiative was started in 2013 following a conference held by the Development Bank of Jamaica (DBJ) at which special guest, Mr. Paul Ahlstrom of Alta Ventures Cooperation challenged the major universities in Jamaica to host a local business model competition where the winners would be sponsored to participate in the International Business Model Competition held in North America annually. The JDSEEL is currently on a drive to engage students from across the University in preparing them for the competition. The training will involve various aspects of the business canvas model, communications skills, pitching of ideas, looking at intellectual property, group dynamics marketing, and other key aspects of a start-up business. Professor Colin Gyles, Acting President, UTech, Ja. in his welcome and opening remarks said that, the UTech, Ja. Business Model Competition together with the work being done by the JDSEEL and the Technology Innovation Centre (TIC) continues to be very timely and relevant in making a significant difference in facilitating the kind of innovation and entrepreneurship that Jamaica needs. He noted that “is it well recognized globally that entrepreneurship and innovation are crucial to the development and prosperity of any country.” He encouraged the budding entrepreneurs to take advantage of the learning opportunity to grow and to acquire new skills and knowledge as they develop as leaders of entrepreneurship and change. He implored former participants to serve as mentors for the new crop of budding entrepreneurs in this year’s competition as they too seek to take their own innovations further to market. Keynote speaker at the launch ceremony, Hon. Floyd Green, MP, Minister of State, Ministry of Education, Youth and Information, lauded the UTech, Ja. BMC as “a step in the right direction.” The Minister noted that “universities in the 21st Century have to concern themselves with the value-added product of critical thinking and solving problems.” “Our universities must inculcate in students that entrepreneurial zeal, creative drive and the willingness to go a step further to ensure that they can succeed,” he said, pointing out that in another ten years some of the jobs that we think are important now will no longer exist. He emphasized that we have to constantly adapt, change and innovate if we intend to remain relevant as a people and as a University. Minister Green called for the competition to be extended to rural communities to introduce the concepts of the business model to young persons who are unable to access this kind of training at a University. He stated that many young persons in rural communities have ideas that can not only transform Jamaica but help reduce the unemployment rate among our youth. In addition, he encouraged the students to be brave and confident in their ideas and to also find a mentor who can assist them on their journey to becoming good entrepreneurs. Miss Pauline Nelson, Communications Consultant, Development Bank of Jamaica (DBJ) speaking on behalf of her company expressed their full support for the 2016/2017 UTech, Ja.BMC. She noted that, “universities are the fertile ground for possibility and creative thinkers as well as thought leaders” and encouraged students to think beyond the boundaries of Jamaica as they contemplate their business ideas. Other sponsors of the 2016 UTech.Ja.BMC are the Private Sector Organization of Jamaica (PSOJ) and NCB Foundation. JDSEEL student participant, Mr. Rowen Johnson, who previously participated in the UTech, Ja. BMC described his experience as a good one. He expressed that the job environment is extremely competitive and encouraged fellow students to look at entrepreneurship as a viable career path. He also encouraged them to be fully committed to their business ideas with passion and conviction, and to give of their best at all stages of the competition. Symbolic Launch: The 2016/17 UTech, Jamaica Business Model Competition was off with a bang, following the symbolic burst of a balloon by stakeholders from left, Mr. Michael Steele, Head, JDSEEL, Mrs. Kim Mair, CEO, Joan Duncan Foundation/JMMB Group Entrepreneurship, Hon. Floyd Green, MP, Minister of State, Ministry of Education, Youth and Information and a representative from COK Credit Union. On Thursday, October 27, 2016, the UTech, Jamaica Students’ Union also hosted a successful Clubs and Societies Day dubbed 'Clubs and Societies Xplosion'. According to Students’ Union President, Mr. Dimitri McGregor, the objective of the extravaganza which saw an outpouring of students and visitors to the campus, was to highlight the role that university clubs and societies play in the holistic development of the student body. 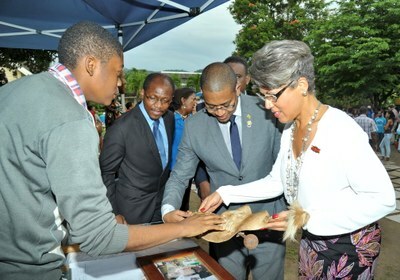 Below are highlights of some of the booths mounted by student club leaders at the event held in Caribbean Sculpture Park. (From left) Prof. Colin Gyles, Hon. Floyd Green, and Mrs. Kim Mair examine an African relic which formed part of the exhibit at the African Cultural Renaissance Movement (ACRM) club’s booth. Mr. Odane Brown, Treasurer, ACRM looks on. 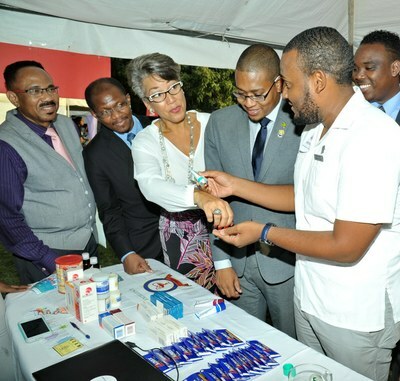 At right Minister Green pays keen attention to a display mounted by Pharmacy students.